I hope your Wednesday is off to a great start! I have been playing the car shuffle again...Mike's car is back in the shop (again! ), sometimes I just feel like "Enough Already!" I am hoping it is finished today, I don't like having to shuffle cars around...such a hassle! Here is a card I made using the hostess set from SU! (For A Friend). I have had it sitting on my craft table for months, unmounted and collecting dust, so I chose one of the images and was determined to make a card with it. 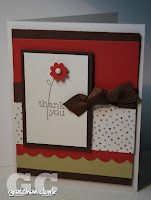 I decided to use my flower punch to add some dimension to the card. It was a pretty simple card, just one ink color and one stamp. Of course I had to jazz it up with a scallop border using my corner rounder punch and some ribbon, lol. I hope you have a super day, thanks for stopping by!! This is really cute! I love the layout and colors. Very pretty! TFS!